Danish DR TV-series Forbrydelsen (The Killing) author and producer, Søren Sveistrup and Piv Bernth, have been kidnapped by a terrorist organization referring to themselves as BFSR (British Front of Subtitle Readers) saying they won’t release Sveistrup and Bernth until Forbrydelsen IV is filmed and aired. BFSR furthermore demands Forbrydelsen IV should consist of 20 episodes, with the original Guðrun and Guðrun jumper, – and with a lot of moving torches seeking in dark places. DCI Tennison leads the police investigation from Scotland Yard. With Minister Jim Hacker giving priority to the case, Tennison is assisted by DC Anna Travis, Wycliffe, Taggart, Reid, Morse, Bergerac and the Lochdubh-based police officer Macbeth as well as Dempsey and Makepeace. Quite unconventionally the British police has requested the assistance of a civilian named Holmes. Also a middle-aged Belgian and an elderly British woman seem to be intimately involved in the investigation. After initial Fawlty search in Gallowshield, the police now believes the kidnapped persons are being held in a scarlet studio in Dartmoor. A butterfly collector, referred to as “The Street”, was apprehended, but now released. BFSR states that unless DR begins filming Forbrydelsen IV, BFSR will start showing episodes of the failed DR crime series Rejseholdet (1983) to the two kidnapped victims. While Bernth is believed to be capable of withstanding this ordeal, it is generally thought that Sveistrup will not survive this IMDb 4.8 rated tv-series. Sofie Gråbøl states she won’t yield to the demands of BFSR, but Kenneth Brannagh has acknowledged his ability to step in at short notice and take over the part of Sarah Lund, with Emma Thompson taking the part of not-actually-dead (it was only a blank shot) Detective Inspector Jan Meyer. This entry was posted in humor and tagged forbrydelsen, humor. One usually needs to take care when writing corrections: An error in an erratum looks silly. 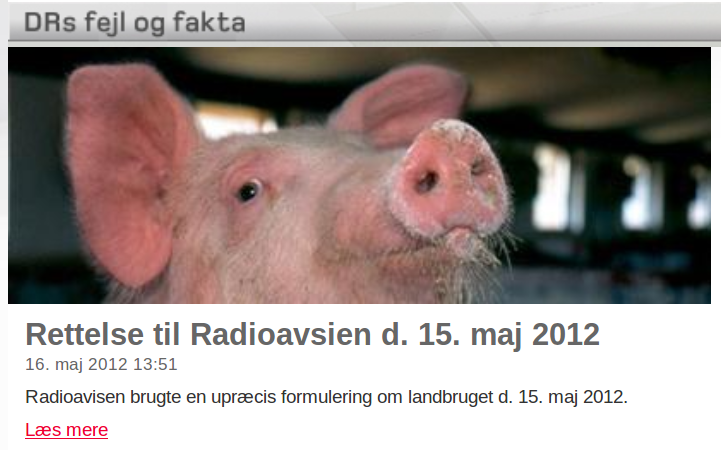 For those with knowledge of Danish would note that a word in the title has a typo: “Radioavsien” should have been “Radioavisen”. Somehow the picture of the pig adds some humor to the typo. Last year in 2010 I looked a bit closer on Danish text mining. The text mining I have done so far has mostly been in English (see, e.g., Mining the posterior cingulate: Segregation between memory and pain components), so stop word lists and sentiment word lists are in English. I had done a bit text mining on fairy tale writer Hans Christian Andersen’s The Ugly Duckling with yet little interesting results. To have a bit of fun I started looking on Danish humor. Researchers have done humor text mining for some time now, e.g., Rada Mihalcea has written a few papers. One is Characterizing Humour: An Exploration of Features in Humorous Texts. The simple approach is to assemble a data set of jokes, e.g., one-liners and contrast it with a non-humorous data set using a machine learning classifier. Mihalcea used Reuter news, proverbs and “British National Corpus” sentences. Following the Mihalcea approach I gathered a small data set of just 497 jokes. Mihalcea collected 16,000 one-liners! To contrast the joke I found Danish sentences from the European Parliament available in NLTK as well as sentences from The Ugly Duckling. I then used the naïve Bayes classifier in NLTK in a straightforward manner on the three classes of texts. Mihalcea reports that among funny features are human-centric vocabulary (you, I, woman, man, etc. ), negation, negative orientation (failure, illegal, etc. ), profesional communities (those poor lawyers) and human “weakness” (stupidity, alcohol, steal, lie). Running the “show most informative features” of NLTK I finds that some of the important words for jokes to be: mand (man), manden (the man), hjem (home), sidder (sits), laver (makes), ældre (older), hedder (is called), hvorfor (why), hus (house), pludselig (suddenly), gave (present), bor (lives), dør (dies), hvornår (when), tog (train/took), spørger (asks), hvem (who). Further down the list I find advokat (lawyer). “man” is human-centric, but why is “home” and “sits” prevalent in jokes? Whats on the word list depends much on what you contrast with, e.g., du (you) and gik (went) appear as important words for the fairytale. For the European Parliament contrasted with jokes words such as hr (Mr.), Europa, fru (Ms.), denne (this), støtte (support), disse (these) and også (also) are important. Both of these follow a joke scheme: “Good, bad, worse” or “And then there was the story about”. This entry was posted in humor and tagged danish, humor, textmining. Danish folklore has it that Swedes are not funny. However, I find that this is not so. Examining Wikipedia I find that the Swedish satire category lists 9 Wikipedia articles. This should be compared to the Danish category on satire that lists 54 Wikipedia articles. So the Swedes has almost 20% as much humor as Danes. I think this high rate will come as a surprise to many Danes. I do not agree with the people arguing that the number of articles should be normalized with the total number of pages on Wikipedia. 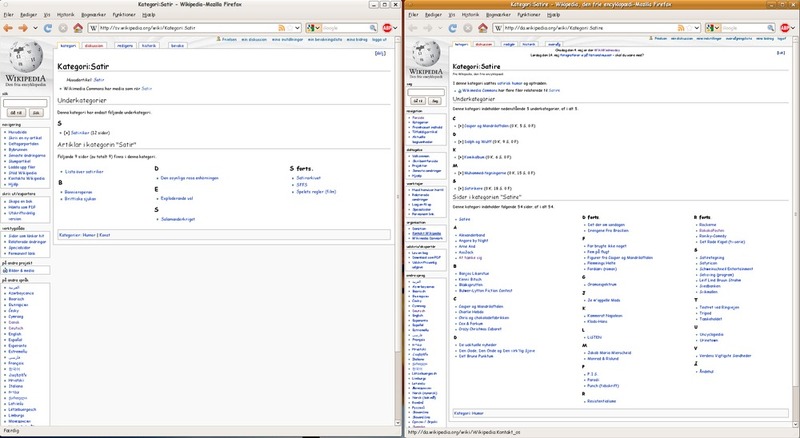 The Swedish Wikipedia has 394’810 content pages equivalent to a satire rate on almost 23 ppm (parts per mil), while the Danish Wikipedia has 148’443 pages bringing the satire rate to 364 ppm. With these numbers Swedes has only 6% as much humor as Danes. I dont think that number is fair to the Swedes. This entry was posted in Uncategorized and tagged humor, sweden, swedish.